This month, roughly two years into the company's autonomous-driving division's existence, Yandex engineers came to Las Vegas during CES to let outsiders go for ride-alongs and gauge their progress. Back in the throes of the Cold War, Americans awoke on the morning of Oct. 4, 1957, to learn the Soviet Union successfully launched Sputnik I, the first artificial satellite, into space. It was a development that escalated the space race and punctured assumptions the United States had led in technological mettle. Could something similar happen again, with self-driving cars? With much fanfare surrounding Waymo's self-driving vehicle project in Arizona, Ford's focus on Miami as a launch point for commercial driverless service, and dozens of other companies doing some form of testing here, the United States has been both the birthplace and leader in autonomous-driving technology. But it's worth pondering if the leader could someday change. Yandex, a giant Russian search-engine firm that also runs a taxi booking service in more than 100 cities, started working on autonomous technology in 2016 and formally started a self-driving development program in January 2017. They often draw comparisons to Google and Baidu, other search-engine giants in their respective countries that have launched autonomous-driving projects. But the comparisons to Google and its Waymo autonomous subsidiary are promptly rejected by the Russians. "People say Yandex is the Google of Russia," says Pavel Vorobev, head of product at Yandex. "But it's a little offensive. It's more like we are the Silicon Valley of Russia." 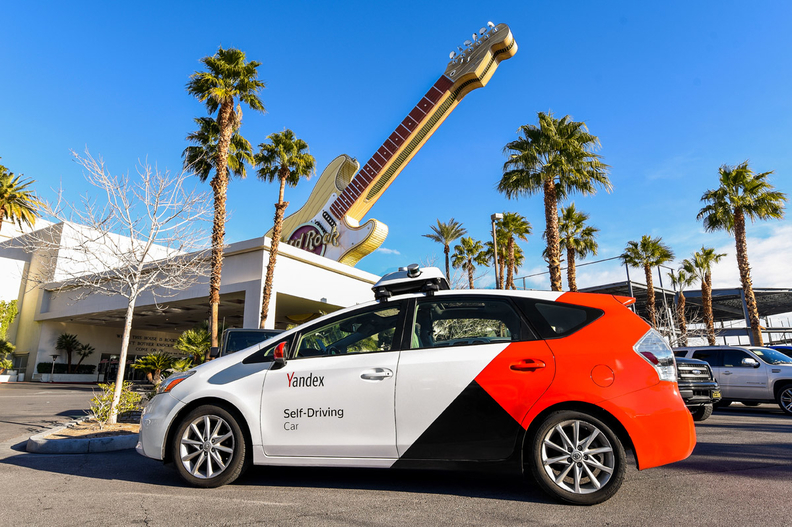 This month, roughly two years into the autonomous-driving division's existence, Yandex engineers came to Las Vegas during CES to let outsiders go for ride-alongs and gauge their progress. From the start, there was a clear contrast between the Yandex demonstration and a dozen or so other self-driving rides others conducted that week. Others required their human safety drivers to operate the vehicle in private parking lots and engage autonomous mode only when we reached a public road. But the Toyota Prius V used by Yandex was under computer control from the moment we rolled out of a parking stall within the garage at the Hard Rock Hotel & Casino, though a human safety driver was behind the wheel. It was the computer that braked, not the human safety driver, when a smartphone-addled pedestrian stepped in front of our path without so much as noticing as we paused before departing on a ride around Vegas. That Yandex was in Vegas at all is something of a marvel. Several members of the Yandex engineering team had visa delays in the weeks leading into CES. So it was left to a single employee who arrived five weeks before the tech showcase to buy a Prius V from a local dealer, retrofit the vehicle with its sensor stack of Velodyne lidar, cameras and radar, not to mention the computing power in the trunk, and then map routes around the city. The visa issues may have been the greatest challenge. Along Las Vegas's busy arterials, teeming with multiple lanes of midafternoon traffic, cars entering and exiting the road from nearby fry pits and strip malls, the Prius itself drove more confidently than any self-driving system observed in dozens of similar ride-alongs in recent years. It handled unprotected left-hand turns with ease. It handled left-hand turns where two lanes were turning left at the same time with ease, multiple times. It accelerated to speeds of up to 45 miles per hour and braked quickly to execute necessary lane changes. Demonstrations of self-driving technology like this should come with a caveat — what happens in a four-mile stretch that's been repeated dozens of times does not replace millions of miles of testing and searching for corner cases. Still, the Yandex car was cruising — and assertively so — through situations where other self-driving vehicles have required assistance from human safety drivers. Dmitriy Polishchuk, head of Yandex's self-driving unit, isn't sweating. "Here, it's easy," he says, with just a little chutzpah. "We came here and didn't know the environment or special rules and figured it out in a few weeks. The truth is we've been testing in Moscow for two years, and if you pick what we've done there, we just had to tweak it for here. People tend to follow rules here." Yandex tests in Moscow now, but the Russian capital is not the company's primary autonomous-vehicle hub. It commenced commercial service in 2018 in Skolkovo and Innopolis, carrying everyday taxi passengers for free, with human safety drivers in the passenger seats of vehicles. Currently, there are 15 vehicles in Yandex's fleet. This year, the company intends to increase that number to more than 100, and export its commercial service offering — again, still with a human safety driver aboard, to Tel Aviv, Israel. In addition to Russian streets where pedestrians mingle into lanes of traffic, other vehicles attempt to turn from two lanes over and chaos rules the day, Yandex has conducted tests in winter weather. Much like his confidence in driving around Vegas, Polishchuk says it's a "misconception" that autonomous vehicles should be restricted by all but the most severe snowstorms. The critical component of making self-driving cars function as a viable part of everyday traffic, in his view, remains honing the ability to accurately anticipate the actions of pedestrians. "This is where the competition will be," Polishchuk said. "The perception problem will be solved, and we'll be more than 99 percent confident in what we see, but to predict what the pedestrian that we see will do next, that is the most complicated piece." To that point, a group of a half-dozen pedestrians was poised to cross the street as we returned to the Hard Rock Hotel & Casino garage. They stepped off the curb, but waited for our Prius V to make its right turn into the garage. Instead, the car stopped to wait for them. They waved us ahead. Our safety driver waved them ahead. They gestured for us to continue. We deferred. The dance continued with all humans enjoying a good chuckle until the pedestrians crossed in front of us and we continued under autonomous control into the garage. Thorny scenarios like that are par for the course in current testing environments for all manufacturers, but predictions take on life-and-death significance once safety drivers are removed from vehicles and there's less give-and-take than the scenario that we experienced in Las Vegas. If self-driving vehicles are to someday fulfill a safety purpose and dramatically reduce the number of traffic fatalities, they'll need to perfect their actions in those situations. Most manufacturers believe their technology will need to far exceed human performance before they embark on deploying autonomous vehicles without safety drivers. Much like its vehicles, Yandex has adopted a deployment strategy that's more aggressive than competitors in that sense. "Once we see we are at the level of a human driver, we can say we have the moral right to actually let it go," Polishchuk says, "because we have these kinds of drivers on the street." Other companies don't believe autonomous vehicles will be accepted by consumers until they've not just equaled, but far exceeded the safety and performance of their human-driven counterparts. Whether there should be precise standards for the competence of self-driving vehicles before they're unleashed remains an open question for the entire industry. Outside of Russia, Yandex may be largely an unknown player. But the company clearly intends to be a front-runner in self-driving vehicles, and isn't shy about saying so. Ambitions were high entering CES, and the ride-along delivered. Whether the demonstration was a one-off event or the start of a reckoning for front-runners remains an intriguing question. Competitors might at least consider that possibility.